Hello ladies! 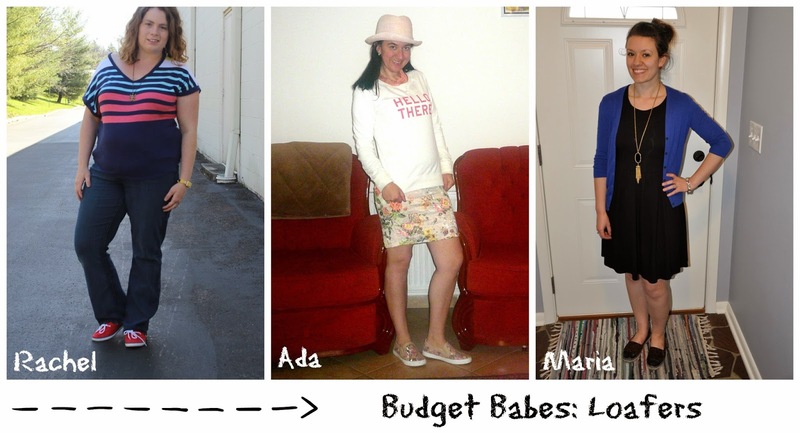 Happy Friday once again :) I'm again collaborating with Rachel and Ada for our weekly Budget Babes series~ this time it's all about the loafers! Mine is below and make sure you check out the other two lovely ladies' cute Spring styles! I got these loafers when Target had their buy one get one 50% off sale and they are amazingly comfy! They kind of make me look like I have cankles in this picture, but just look past that... I think loafers like these make the perfect spring shoe. By the time summer rolls around, my feet get so hot that all I'll wear are sandals, but during this in-between times they work really well. And based on all the ways we've styled them above, they go well with jeans, skirts, dresses, and just about anything! I love your round down idea haha! Cute outfit and I just love cobalt blue. Have a great weekend Maria!! What a cute outfit Maria. I love the necklace, cardigan and loafers. I added very similar loafers in black+white which you will see soon. I agree, slip-on loafers and the more girly style loafers go with pretty much anything and can be worn to work or a business casual type of office. Cannot wait to see what you come up with, next week. Have a lovely weekend! This is such a cute outfit! Love the blue and black combo! I've been seeing a lot of cobalt and black outfits lately! I'm loving the combo! Those espadrilles are adorable! I tried to find them in my local Target to try them on but they were out in every color in my size. Grr! I love these shoes so much!! I actually really wanted them, but Target has been out of the size and color I want forever. I decided it wasn't meant to be but every time I see someone else wearing them I get kind of sad hah! Anyway, you look great! love the blue and black together! Great cardigan! I host a weekly fashion link up every Wednesday (still live) and would love you to stop by if you get a chance!